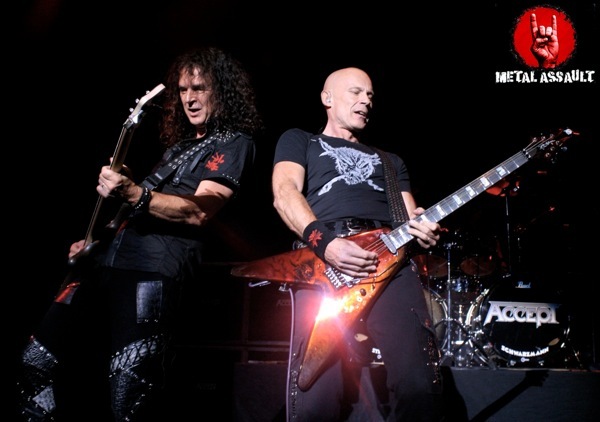 September 12th 2014, Saban Theatre, Beverly Hills CA: Continuing on with their triumphant resurgence, teutonic metal legends Accept released their 14th studio album ‘Blind Rage’ in August via Nuclear Blast Records, the third since the band’s Mark Tornillo-fronted rebirth in 2010, and a record that has greatly succeeded in further strengthening Accept’s relevance in the modern day metal world, 35 years since their inception, as the 11 tunes on this 60-minute effort portray a creatively potent and sonically fierce Accept. 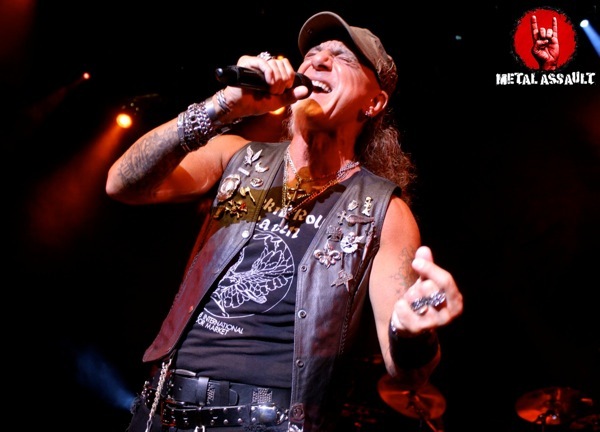 Following a run of European festival appearances, they set out on a special and exclusive four-show US headline run comprising San Diego, Los Angeles, Las Vegas and New York with support acts Metal Church and Raven for an all old-school lineup. 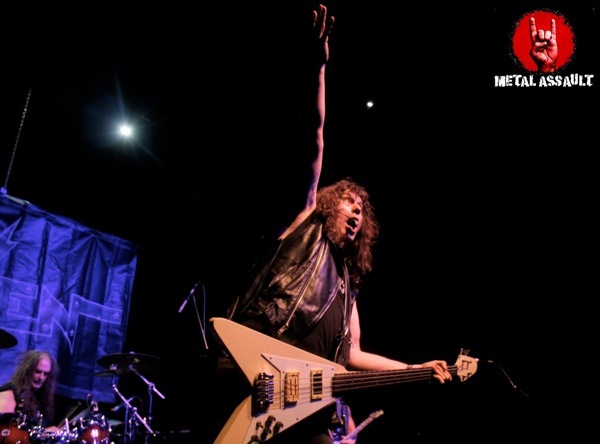 Sans Metal Church who had to cancel last minute owing to their singer’s health issues, Accept and Raven played the San Diego show at the Belly-Up Tavern last Thursday and arrived in Beverly Hills last night to bring the metal to the Saban Theatre. 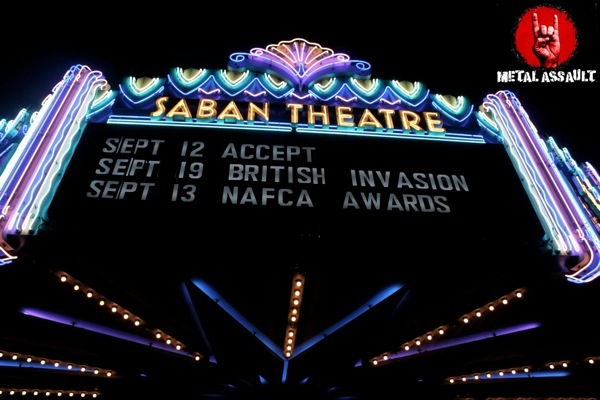 Doors opened at 7, ticket holders lined up outside the venue trickled in, and almost all first-timers, obviously metalheads not used to attending these types of shows in places as graceful and upscale as the Saban, were bewildered by their surroundings upon entering. Attendees made their way to their respective seats, and at 8 PM, the show began with British veterans Raven taking the stage for a 45-minute set presenting their brand of old-school metal showmanship filled to the brim with cheesy stage moves, exaggerated facial expressions, crowd play and instrument antics as brothers John and Mark Gallagher locked their bass and guitar together almost in a sword fight at one point, John hitting all the high notes vocally. A good portion of the crowd was seen head-banging and responding positively to Raven’s set. Some might say the appeal of their live show lies in the visual presentation more than in the actual music itself, but they were by all means a solid opener for a band like Accept. The atmosphere had built up significantly in the intermission and there was a great degree of anticipation surrounding the headline act. Many esteemed members of Los Angeles’ metal community were seen in attendance. At 9:20, the lights went out, and the first 30-second segment of the ‘Blind Rage’ album opener ‘Stampede’ was played as an intro on the PA to pump all the metal hearts further, and momentarily after, Accept arrived to play the rest of the song and what followed next was a wholehearted deliverance of pure metal focussed on the post-2010 material but with a sufficient dosage of the pre-Tornillo era to honor the sensibilities of longtime fans of the classic lineup. As many as six songs off of ‘Blind Rage’ were included in the set, and besides the ‘Stampede’ single which fans are most familiar with, ‘Dying Breed’ stood out as one of the highlights not only amidst the Blind Rage selections but the entire set, and so did ‘Final Journey’ wherein the chorus lines made for some epic head-banging moments. These songs made as much of an impact as the older ones and there really wasn’t a great divide between the old and the new as is the case with most other bands, which just goes to prove the sheer strength of Accept’s new material. They also presented great picks from the previous two albums ‘Stalingrad’ and ‘Blood Of The Nations’, the rendition of ‘Shadow Soldiers’ off of ‘Stalingrad’ coming across with tremendous conviction, and songs like ‘Pandemic’ and ‘Teutonic Terror’ off of the latter keeping the heads banging and fists raised. Led by the pristine guitar play and towering stage presence of Wolf Hoffmann and aided in no small part by his band mates, Peter Baltes in particular with his monstrous but delightfully clean bass sound, Accept as a performing group are at the peak of their powers and this peak only rises further every time they grace us with their live show. And as for vocalist Mark Tornillo, in comparison to the first LA show he did with Accept at the Key Club in 2010, he’s clearly more comfortable in his role, infuses greater vocal variations on the material he didn’t record with the band, and garners a higher degree of respect from fans as a result of the incredible performances he has put in over the past four years, both live and in the studio. The change in singer, specially when the previous one was and still is such a metal icon, usually signals the death of any band but Accept continue to defy the odds and rewrite the rules. Of course, quite a few of the classics were also played, including ‘Metal Heart’, ‘Fast As A Shark’, ‘Restless And Wild’, ‘Losers And Winners’ and the definitive metal anthem ‘Balls To The Wall’ which brought an end to a show this audience felt blessed to be a witness to, but the one selection that would stand strong in my memory for years to come was ‘London Leatherboys’, a gravely under-appreciated old Accept tune that I’ve always loved and never expected to hear live. In my humble opinion, Iron Maiden, Saxon and Accept are the only three metal bands about whom nothing bad can be sad in terms of the quality of their live performances, and with Iron Maiden and Saxon not likely to perform in Los Angeles in 2014, Accept will firmly sit on the throne that would read ‘Best Performance Of The Year’, and while there are other bands that are often categorized as gods of the metal genre, Accept in its current incarnation deserves to be worshipped in equal measure.